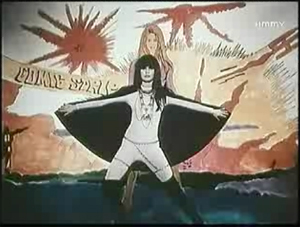 I think we've dicovered one of the goofiest comics-related things ever...this video clip for Serge Gainsbourg & Brigitte Bardot's 60s song, Comic Strip. Yup, that's Brigitte up there, in a brunette wig and superhero costume (which I find creepy, but Evan says is pretty accurate for French 60s comics most likely). Not to be missed!! Forgot to say - while you're there, check out the playlist that it comes from, there's some really interesting clips of 60s French pop! I mainly know the Serge Gainsbourg stuff but there's lots more I've never heard of. Yup! Soup for breakfast!! Most days now, Emily and I have a miso soup breakfast or brunch (okay, a lot of the time my breakfast is tea while she has oatmeal, then we have this 2-3 hours later). And it's actually probably the best thing I've found to eat first thing in the day. I always was fascinated by the idea of the traditional Japanese breakfast after seeing it in enough TV shows -- I'm not so sure about the fish, but soup and rice sounded pretty good to me. I've never been into the whole sweet breakfast paradigm and while the eggs and meat thing works for me, it's heavy and a pain to cook. I always meant to try it but never did, but I've been trying to be more diligent about actually eating breakfast every day. And finally I got motivated to try it out, after reading Japanese Women Don't Get Old or Fat (*see more on this book below) and seeing her "Japanese Power Breakfast" idea (basically, miso for breakfast). 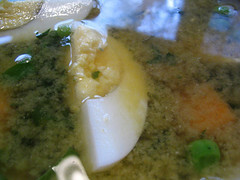 I didn't even really look at her recipe, since I knew how to make miso soup just fine. But I did use her idea of adding a quartered hard-boiled egg, and her list of vegetables to use made me feel better about adding whatever I had sitting around. Start by putting 8-12 ounces of water in a small saucepan (I use 12oz because I'm sharing with the baby! 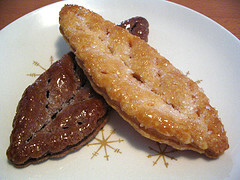 ), and at this point add any raw hard vegetable you may have (sliced carrots, daikon, etc) so they cook evenly. (At this point I also add any frozen puree.) Bring water to a boil, and add your dashi powder . Stir to dissolve. Add soft foods like tofu now, and then add your miso paste . While your water is heating, in a microwave-safe bowl, put whatever frozen and/or leftover vegetables you've got and heat for 1-2 minutes in the microwave. Top veggie mixture with a quartered hard-boiled egg. Ingredient ideas - the soup I took the photo of had peas, spinach, daikon, diced sweet potato (leftover, not raw) and a big spoonful of kabocha puree in the bottom of the bowl; I added tofu and some negi (use leeks or scallions, although leeks are probably closer) to the miso. Today my broth had pureed butternut squash and carrots added, and my veggies included edamame, corn and a little spinach for color. I can't really imagine anything that wouldn't work -- in the book, she talks about using cold cherry tomatoes, and while I can't personally imagine doing that, they obviously think it works just fine. Speaking of the book...I got it from the library on a whim last month. I got the feeling that it was a book that had been long in the making, and got slapped with the unfortunate title because of French Women Don't Get Fat selling so many copies. It's a very nice introduction to Japanese cooking and food culture, but if you are at all familiar with Japanese cooking it's not going to break any ground for you. The weirdest thing for me was getting to some of the recipes and discovering that they were basic dishes with new names - her "Iri Iri Pan Pan" is called "tri-color donburi" in at least 2 cookbooks I have, for example. But there's some good info, and if you're interested in Japanese cooking I would recommend it as a library read. It's not really something you're going to need to keep referring to, I don't think. Last October I wrote up Target's Ready. Sit. Read! book club promotion, but I never got around to the follow-up, which was the awesome stuff that we got for signing Emily up! I was shocked to get a huge box that contained a whole load of stuff, all illustrated by J. Otto Seibold (of Olive, the Other Reindeer et al). First came out the heavy cardboard backpack, with everything else stuffed inside. Parts to convert the backpack into a jetpack or angel wings (or bird wings? 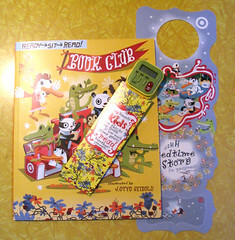 not sure), stickers, a book, an electronic bookmark (very cool), door hanger, and book club flag. I'm not sure if they are still sending it all out (they didn't say when I signed her up that she'd get all this stuff!) but it's worth a try. (I'm tempted to get someone to sign up at their address so we can stash extras for Emily!!) Photos of the swag are up at flickr (although it'll take a wee bit of time for that link to be working, I think - in the meantime, click on the photo above and just go backwards through the photos). Notice that I did not say "super-cuteness!!" because I just noticed that I've had an exclamation point on every entry for a month. Yeesh! Anyway, this is a wooden puzzle, called "Magic Mushroom" that we got Emily for her birthday (her first wooden puzzle, and she loves it. Well, she loves taking the pieces out, anyway). 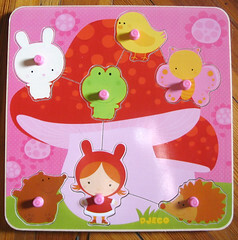 I spotted it on moolka.com, and fell in love with it and its companion puzzle "Magic Tree" right away. I was happy to see that there was a design credit on the packaging, because I love the art. It's by Nadia Berkane, who I can't find much info on, other than some listings on amazon.fr which appear to be a totally different style (or by a different Nadia Berkane?) and a site with baby items illustrated by this Nadia Berkane which are adorable. I want them all! Also coming once this job is turned in: my tie one on entries, cutie cupcakes made for Emily's birthday (no, she didn't eat any! ), Miyazaki goodness and more! Also trying to fix a bunch of techy things, like set up a Technorati Profile for me and one for Evan. Anyway, hope your holidays were great and your new year even better. See you soon!